New Theatre presents HARVEST by Richard Bean at the New Theatre, Newtown. 7th October - 8th November. Richard Bean became a playwright late, at 39. 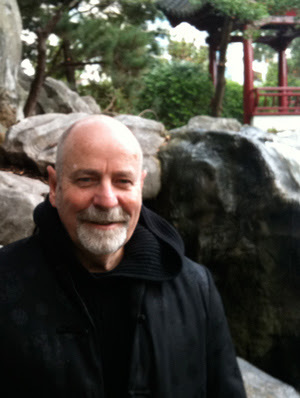 Since 1995, when he wrote a libretto for an opera, PARADISE OF FOOLS, he has finished some 23 works for the theatre. He will be a familiar name for those of us who saw the Royal National Theatre touring production of his adaptation of Goldoni's A SERVANT OF TWO MASTERS: the comically glorious, ONE MAN, TWO GUVNORS (2011), last year at the Sydney Theatre. This year, 2014, alone, he has written PITCAIRN for the Chichester Theatre; GREAT BRITAIN for the Royal National Theatre, and has, MADE IN DAGENHAM, a musical based on the film of the same title, about to open in the West End. Prolific, indeed. I have been a fan of his work and would include, THE HERETIC (2011) and ENGLAND PEOPLE VERY NICE (2009) in my wish list to see, since my first encounter with him as a writer when I read HARVEST. 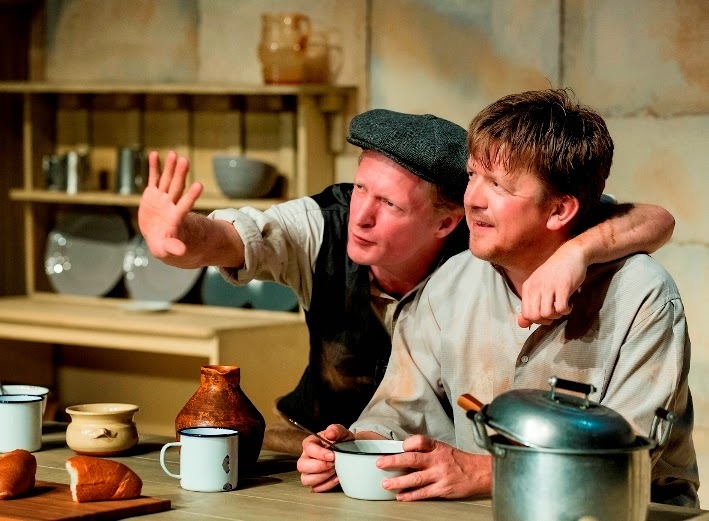 HARVEST was first presented at the Royal Court Theatre, in 2005, and tells in seven scenes, the saga of a farming family - pig farmers - through four generations, battling to protect their livelihood. On the 14th May 1875 Lord Primrose Agar, drunk as a skunk, wagered one of his tenant farmers, Orlando Harrison, that his border collie pup Jip would outlive the 94 year-old Harrison. The prize would be 82 acres of up and down known as Kilham Wold Farm, near Driffield in East Yorkshire. Thirteen years later, having buried the dog, Agar shook hands with Orlando and conferred on the Harrisons a century of struggle. Beginning in 1914, at the commencement of World War 1, we are introduced to the family, particularly, William (Jeremy Waters), then 19 years old. The play touches down in the farm's kitchen again in 1934, 1944, 1958, 1979, 1995, and finally, in 2005. Each scene is a comic emotional gem of human observation. It is William that is the constant character throughout the time span of this epic journey, an incredible, but credible, wheelchair bound 109 years of age at its end. The play reveals the development of the farmer's plight over this long arc, and the pressure of the evolution of the world and its economic politics on the lives of the ordinary worker. The wonderful thing of this play is the drawing of the characters in the family and the district, by Mr Bean. They are drawn with deep admiration and affection and a warm-hearted sense of the comic that is at the core of good mankind. William is an amazing hero, whose generosity of spirit carries us through the tribulations of this play. The humanity is the jewel of the writing, the comedy its sparkle. The title of the play is a sadly ironic comment on the world values we live with. Directed by Louise Fischer, there is an unevenness in the acting capabilities of the cast of fourteen, and a not always secure hand on the orchestration of the individual scenes (e.g. The noise of the 1958 'birth' scene) to bring this monumental work to an always satisfactory production. Mr Waters tackles the role of William with gusto but not always with a consistent sense of arc construction, but gives, as usual with this actor, an adventurously witty exploration. John Keightley (Parker), Sarah Carroll (Maudie), Bishanyia Vincent (Laura), Benjamin Vickers (Titch) and Alex Chalwell (Blue) make some impact in the chaos of the production. Too, the Set design by Bethany Sheehan, is a comfortable reliability to the production as is the lighting by Tony Youlden. "God made the country - man made the town." Virgil (70 - 19 BC). The play stands wonderfully, despite the unevenness of the production. That it is the New Theatre that finds the wherewithal to produce contemporary work with a cast larger than 10 on a consistent basis tells us something of that company's commitment to good and significant writing. One wonders how is it that the best subsidised theatre company in Sydney, The Sydney Theatre Company (STC), rarely casts (and pays) more than 12 actors a show. MACBETH, with, what was it, seven actors? CHILDREN OF THE SUN, adapted from Maxim Gorky, for the Royal National Theatre in London, by our very own Artistic Director, Andrew Upton, with a playing cast reduced from 20 odd in London, to what, 12, in Sydney? What is going on? Thanks to the New Theatre, Sydney audience's got to see Jez Butterworth's JERUSALEM, along with the rest of the world, instead of just a second production of Butterworth's lesser MOJO, that the Sydney Theatre Company thought was more valuable for us to see. So, now: HARVEST, and the prolific Richard Bean, has, at last, a showing in this vibrant International city, beyond the International touring success of ONE MAN, TWO GUVNORS. Pier 4, led by the STC, that precinct of the Arts at the cutting edge of contemporaneousness for Sydney! I wish. Thank God for the adventurous New Theatre.